Tiny B has quite a story behind her, but I've chosen to not talk much about it here. I do feel comfortable in sharing that she suffers from severe migraines, and that's a scary thing to battle when weaning from a feeding tube. She's doing transitional kindergarten this year because it's her year to learn to love eating and just to enjoy life. 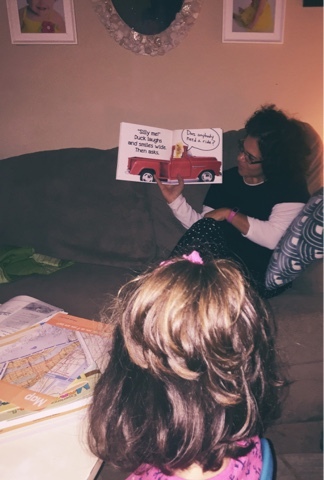 This year is a "gift" and her educational specialist (the person who I answer to in her charter homeschool) and I repeatedly talk about how crucial it is that she just learns to love learning this year, in a relaxed setting. 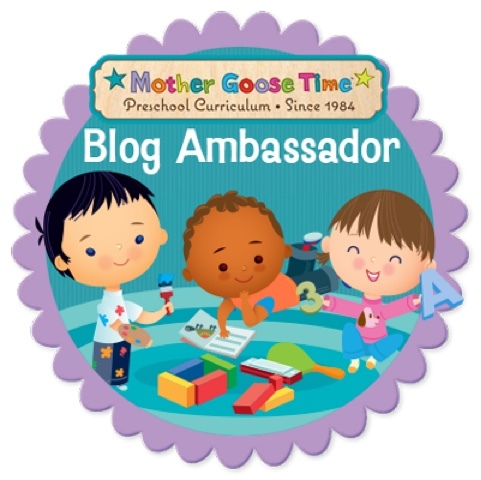 This is where Mother Goose Time (MGT) comes in. I've chosen to not do the curriculum given to me by the school, and to do MGT instead. There are so many reasons for this, but mainly because I can tailor it to Tiny B and Strong B's needs in an educationally fantastic way. 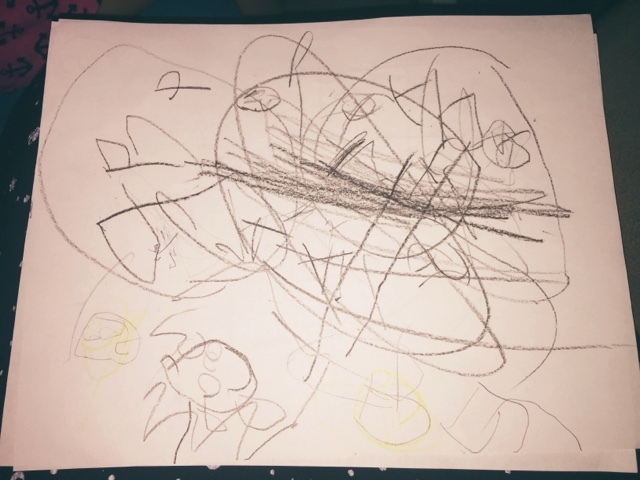 We've been dealing with an on and off migraine episode for three weeks now. It's been hard on all of us. Then she got the flu. You can imagine how this has affected her educational experience. Fortunately with MGT I'm able to pull from it exactly what I need. 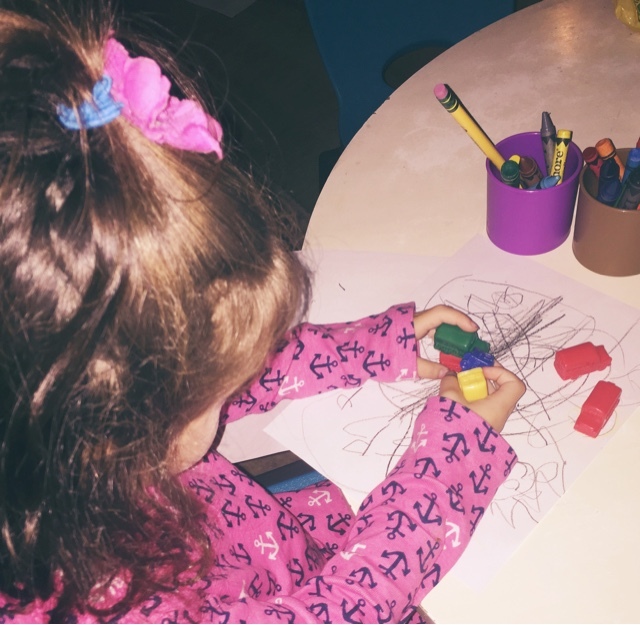 I don't need to do every.single.activity in order for me to teach the pre-k standards. 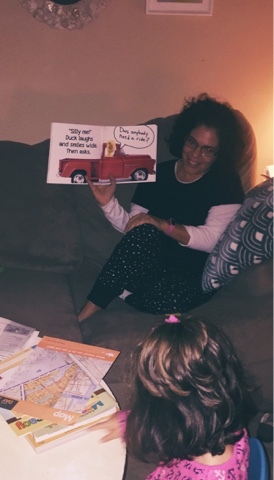 I've been choosing 1-3 activities a day and on some days, we've done nothing but read books about transportation (our monthly theme) from the library. Admittedly, I've been so worried that her skills would suffer. In her usual way, Tiny B has amazed me with what she can accomplish. Tonight she finally felt better after suffering with a fever for three days, so I pulled out MGT and we got to work on Day 3 which was about maps. We don't have much light in our living room at night, so you'll have to forgive the pictures. 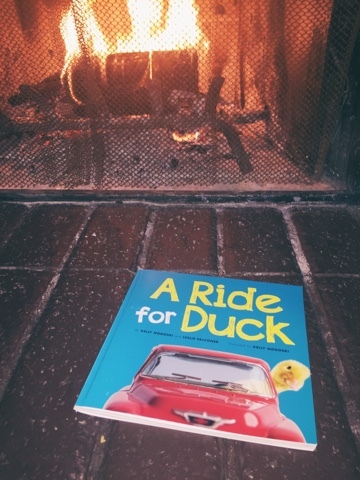 My husband lit a fire in the fireplace, and I read the MGT book "A Ride for Duck." Yes, I'm in my pajamas again. It was a hilarious book and was a great way to talk about rhyming. It was hilarious because there was a fish head on a motorcycle. We couldn't stop laughing. We did our usual discussion after reading, in which I asked green, yellow, and red questions. Then we discussed maps and looked at maps and then made a few. 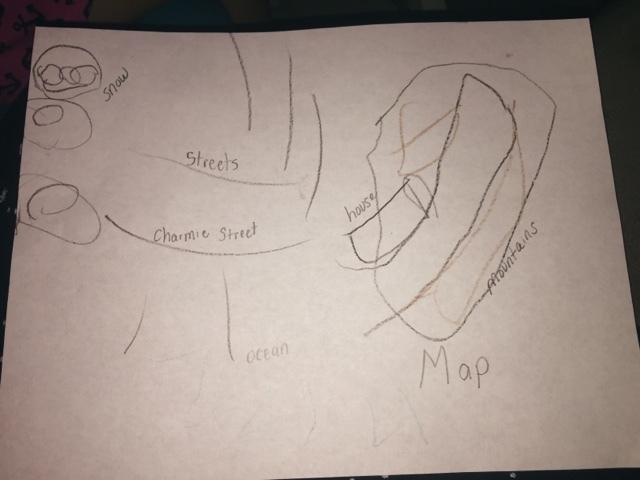 This first one was her creation, and I wanted it to look like a map, but it didn't. I didn't think that she quite understood the concept of making a map, so I helped to guide her in her next one. I walked her through making the roads and asking her about special places on her map, and then I could see that she understood. We then drove our busses on the map. We received these a few months ago from MGT and I just love them. Driving the busses on the map really helped her to make the concept more concrete. I then did a few pages of Math and More and Literacy and More pages in her MGT workbooks. 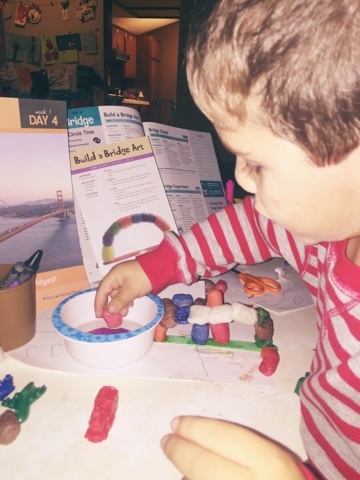 She did not want to stop learning and neither did Strong B, so they insisted that we start Day 4, which is Bridges. They built bridges using cellophane noodles. I thought this would be over quickly as we had already been doing school for a long time, but this activity actually lasted a long time! 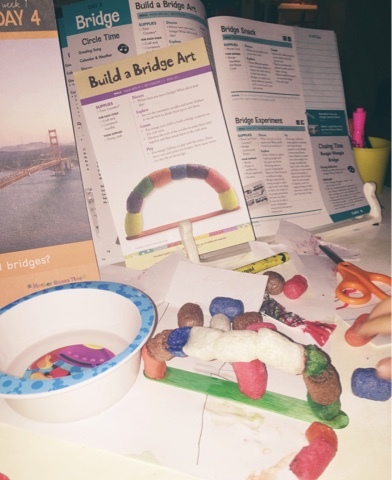 Their fingers were getting their fine motor practice and their brains were busy thinking of ways in which to build their bridges. We took out their manipulatives from this month, and they drove trains and flew planes over and around their bridges. It's been a rough few weeks. I'm praying that health will be restored to our home very soon so that this mama's heart can experience some calm.